FOR ALL RESULTS, HEAD OVER TO IPWTV.COM! 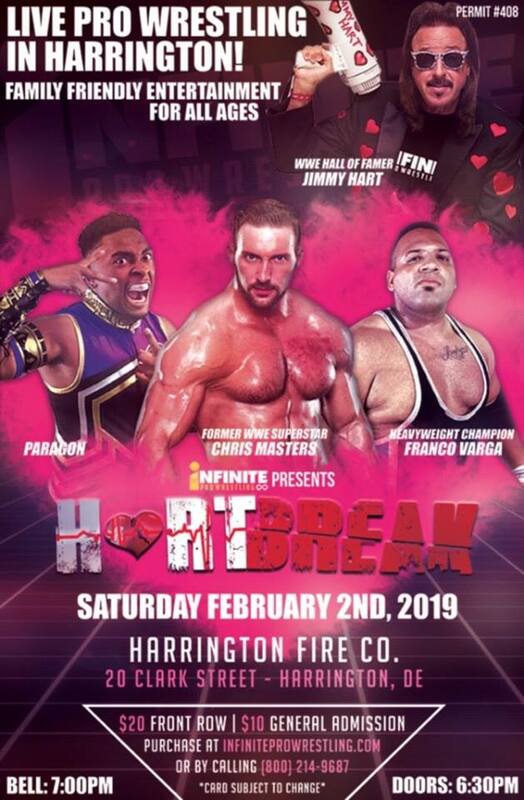 Infinite Pro Wrestling Presents: Heartbreak featuring The Mouth of the South Jimmy Hart, Chris Masters, and benefit for Lamar Wayman (recipient of the IPW Gladiator Award). Jimmy Hart was special guest General Manager for the show. IPW granted Jimmy Hart full authority for the night. To see this event, go to IPWTV.com and subscribe today! Below are just highlights of the event. Match #1 - Kris Rex vs. Royal Money - Kris Rex entered the ring; however, Royal Money did not show for the event! General Manager Jimmy Hart replaced Royal Money with Hobo Harry! Kris Rex defeated Hobo Harry. Match #2 - DeJuan O’Neal vs Beau Crockett - The Beau Show was in full form tonight, along with Jake Hollister by his side, Beau secured the win over the debuting DeJuan O’Neal. Match #3 - Golden Pinky Society vs The Birds of Freedom - This was a great tag team match, proving that IPW brings great tag action in the ring! The debuting GPS defeated BOF in their debut! What has everyone talking is the dance between these two loved teams after an incredible match. Match #4 - Big Bang Nicole vs Charlie Kruel - This match showed how dominate Nicole can be, dominating Charlie throughout the match. However, Charlie gained an advantage late in the match to defeat Big Bang Nicole! Another debut win! Match #5 - Bad, Bad Banks (C) defending against Paragon and the debuting Sless Taylor - This exciting match proved to be what all the hype was about. In the end, Banks showing why he is the champ, walked away still the champion! Match #6 - Franco Varga (C) defending against Chris Masters - Jimmy Hart came to ringside to get a good look at this match. During the match, Masters showing why he is the incredible athlete that he is, coming close to gaining the pin on the champ. In the end, Chris Masters pinned Franco for the three count. Chris Masters for the win, but what happened after the three count, you have to see on IPWTV.com! View the whole show now on IPWtv.com! Featuring The Mouth of the South Jimmy Hart, Chris Masters and the first iPPV event! Lamar Wayman receives the Gladiator Award. 5. Bad Bad Travis Banks (Champion) defeated Paragon and Misery in a Triple Threat Match, retaining the TV title! 6. Franco Varga (Champion) defeated Simon Grimm to retain the IPW World Title! IPW World Heavyweight Champion Franco Varga defends against Former WWE Superstar Simon Gotch! 3. The Main Attraction (Beau Crockett & Jake Hollister) vs. The Homeless Heroes. Beau announced that Jake was injured and could not wrestle, so a one on one match was granted. The Homeless Heroes decided to do “rock, paper, scissors” to see who would wrestle and Hobo Harry won. Beau Crockett defeated Hobo Harry to score a victory in his IPW debut. 4. Travis Banks (IPW Delaware State Champion) defeated “Diamond” Victor Griff (IPW Internet Champion) to become the undisputed IPW Delaware State Champion. 5. Roni “Big Bang” Nicole defeated Annabelle in a dominating debut! 6. Brian Cage defeated Franco Varga to retain the Impact Wrestling X-Division championship! Go to our Facebook page to catch our live streams at each show! 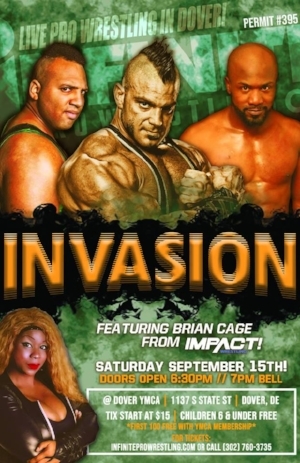 First time in Delaware, the Impact X-Division Champion Brian Cage defends his title against Franco Varga! IPW Tag Team Championship will be decided tonight! Bad Bad Banks defeated Chance Prophet and Paragon in the Triple Threat Match. Iron Legion defeated Joe Pace and Ace Prime to become the new IPW Tag Team Champions! Franco Varga defeated Big Michael Elgin to retain the IPW Heavyweight Championship! Thank you to Wrestling Inc for posting the article and @KYCaseyKing for the video of his speech on the page! July 7, 2018 Tag Wars! IPW World Heavyweight Champion Franco Varga defends against Big Mike Elgin! This match had the internet buzzing! The winners of the tournament match will team up, where the winners of the match would face off for the IPW Championship. Match 6: Franco Varga and Chase Owens defeated Chase Armstong and Billy Masters. Match 7: Franco Varga defeated Chase Owens to become the first IPW Heavyweight Champion! Catch the original Crown Jewel event as Franco Varga defends the IPW World Heavyweight Championship against “The Crown Jewel” Bullet Club member Chase Owens! Infinite Pro Wrestling Presents: A DAMN! Good Time! Pre Show Match: Paragon Kris James defeated Billy Masters. Both making their debut. "Diamond" Victor Griff defeated Royal Money to become the new Internet Champion. Drake Evans Vs. Billy Dixon Vs. Dexter Macintosh ended in a no contest when Dexter Macintosh performed Shattered Dreams to Billy Dixon. Drolix defeated Louis G. Rich. The Homeless Heroes defeated Real Money. After the match, Real Money beat down the Homeless Heroes. Jake Hollister w/ Sonny Deeds defeated Kekoa when Sonny interfered. #1 Contendership for the Infinite Pro Wrestling Delaware Championship. Ty Awesome defeated Franco Varga (special referee IPW Delaware State Champion Travis Banks). Into the match Travis failed to count to three and left the match. After Franco berated the fans and obviously turning, Ron simmons came out. As he was about to deliver his famous line, Franco tried to hit him with a chair. Ron ducked and Franco's chairshot bounced off the top rope, hitting himself in the head. Ty hit the 450 spash and senior official Craig Pendergrass counted the three. May 5, 2018 A Damn! Good Time! Featuring Ron Simmons! You have to see the ending to this one!